Time for a spot of cooking! It seems ages since I last shared a recipe over here so when The Happy Foodie asked me to take a little culinary challenge, well I simply couldn’t resist, dear Reader! As anyone who knows me well knows, new cookbooks are pure heaven to me. I simply can’t resist flicking through tantalising recipes, thinking of occasions that I might try one out – some of them are even to be found on the bedside table for just before bed reading! 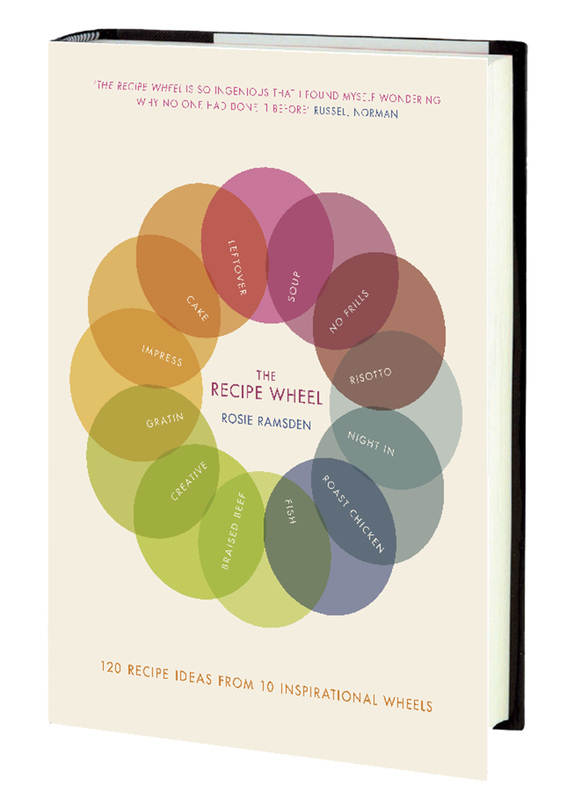 So when I came across Rosie Ramsden’s new cookbook, The Recipe Wheel, I was intrigued to find something rather more exciting than a collection of delicious treats to cook and serve up. The concept is simple but innovative at the same time. There are series of mind maps – one basic recipe at the centre of the wheel which can be adapted to suit any occasion, mood or variety of ingredients: Cooking for Friends, something for a Night In, creating a dish to Impress, hassle-free No Frills recipes and even ideas for what to do with those Leftovers. The core of one recipe ‘mind map’ could be Roast Chicken and then with Rosie’s creative recipe wheel, this basic recipe is translated into a Chicken and Mango curry for a Night In or a delicious dish to Impress like Chicken salad with Blood Orange. No hard and fast rules which allows the cook to mix and match ingredients and be creative with a dish. Sounds brilliant, doesn’t it? Perhaps one of the best things about the recipe wheel is that it gives great ideas for leftovers too. My very own courgette wheel! 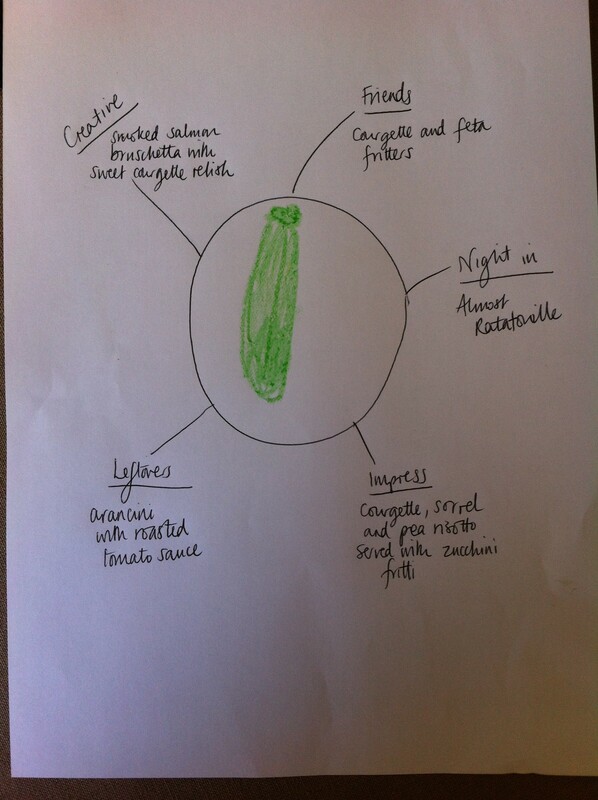 All of my recipes are courgette based, some using a little to add background flavour, some where it is the star of the show and some fancier than others but, just like Rosie’s fab recipe wheel idea, each dish suits a particular mood or occasion. Jerry certainly hasn’t complained about my 5 new ways with courgettes and he’s a self-certified carnivore. Bitten by the bug, I’ve been thinking of recipe wheel ideas ever since and have already tried quite a few dishes from The Recipe Wheel. It’s amazing that no one has thought to put together a recipe book like this before. No more endless thumbing to the index to work out recipes using up the ingredients in the fridge, no more wondering about how you can elevate a recipe you’ve been churning out for years – Rosie’s done that all for you! She’s certainly given me lots of new ideas. 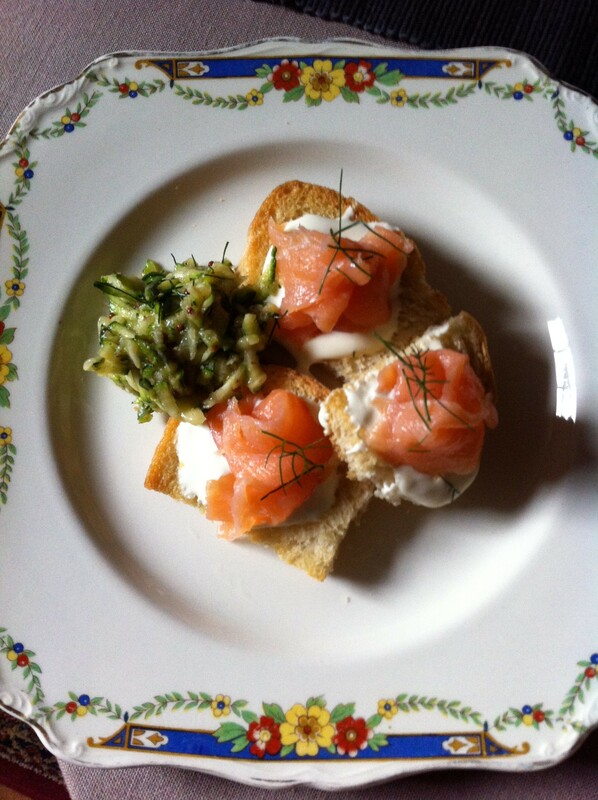 I’ll leave you with one of my favourites from this week – Get Creative: Smoked salmon bruschetta with sweet courgette relish. A perfect dinner party starter that allows you to spend your time with a chilled glass of rosé rather than slaving over the stove when your guests arrive. Couldn’t be easier….. Into a mixing bowl, grate the courgette and add the finely chopped spring onion. To this, add mustard, cider vinegar, olive oil, honey, salt and pepper. Using a little whisk, whisk the wet ingredients into the courgette and spring onion and taste. Now add a handful of chopped fresh dill and leave for 1 hour in the fridge in a jam jar for the flavours to infuse. Bruschetta part: Make some rough croutons using French bread sliced on the diagonal, drizzle over some olive oil and bake in a hot oven (180 degrees centigrade/350F/gas mark 4) until golden. Leave to cool. To 2 heaped tbsp of crème fraiche, add 1 tsp of horseradish, a squeeze of lemon and a tiny pinch of salt – mix well. Using a teaspoon, place a small amount of the flavoured creme fraiche onto your toasted croutons, add a piece of smoked salmon to finish. Garnish with more fresh dill and serve with the sweet courgette relish on the side. Now all you need is someone to pour you a drink – summery heaven! Long may this glorious sunshine last! This entry was posted in Recipes from Margot's Kitchen, Uncategorized and tagged arancini, cooking, cooking for friends, courgette, Courgette and feta fritters, Dinner a deux, dinner party, Ebury, Feeding the hordes, freelance writer, get creative, impress, Kitchen suppers, leftovers, night in, Pick, Preserve and Pickle, Random House, ratatouille, Rebecca Fletcher, recipe, risotto, Rosie Ramsden, sorrel and pea risotto, sweet courgette relish, The Happy Foodie, The Recipe Wheel, zucchini fritti on July 29, 2014 by admin. Hmmm… I wonder if there is time after Cowes Week racing to cook that for the crew of Widgeon?! Surely there’s only room in the cockpit for beer and rum!! Loved your wheel Selma – love the sound of the Truffle chicken. Primrose thanks you for your lovely comment about her drawing. I shall look forward to reading more of your blog. Having a courgette glut again this summer (happy place, love courgettes) I love your courgette wheel! From a fellow happy foodie wheel poster!